Welcome to Derrydale Farm. We’re Meg & Kevin Stuedemann. We sell beef by the whole, half, and quarter and hogs in whole and half options. We often have a waitlist and will be happy to put you in the queue. Or drop us a line and we will keep you updated about availability with our occasional newsletter. We also milk about 70 colorful cows twice a day. Our dairy is certified organic and you can find our milk and cream in Organic Valley products. 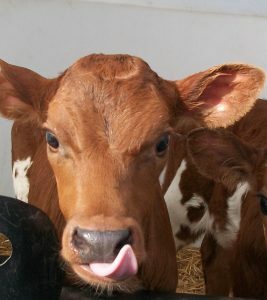 When our cows calve, we raise the heifer (girl) calves to join the organic milking herd. The bull (boy) calves grow up to be beef. Nose around our site, drop us a line, give us a call. We’ll be glad to know you.